When you hear the word wrestling, there’s a handful of names that you’ll be rhyme off. Undoubtedly the one at the top of everyone’s list is the immortal Hulk Hogan. It was Hogan and Vince McMahon that catapulted the then WWF to heights that no other company had reached before. Despite Hulk Hogan and the WWF parting ways, he didn’t stay away from wrestling for long. He then moved onto WCW and after a short stint as Hulk Hogan he then made a transformation. This transformation was one of the biggest in the industry. As someone that always played a face, Hulk Hogan then became a heel for the first time. He transformed himself into Hollywood Hulk Hogan. 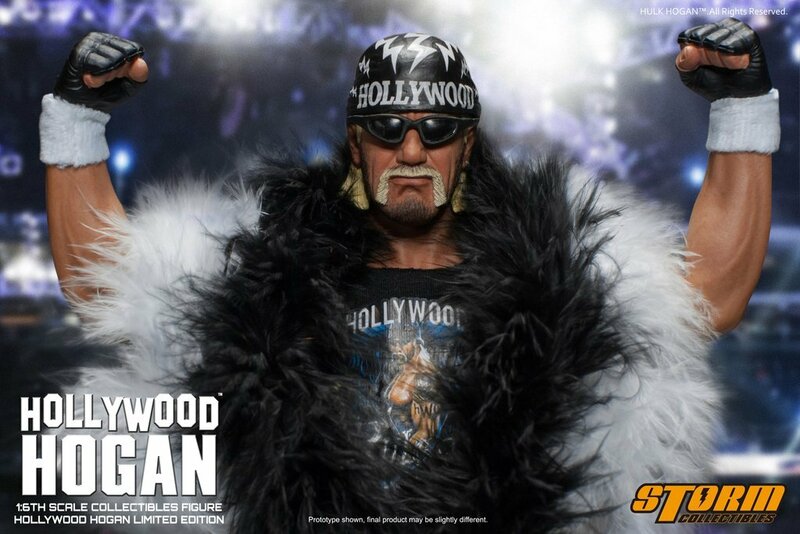 For the first time ever, Storm Collectibles have brought to the market a 1/6 scale action figure of Hogan in his Hollywood Hulk Hogan persona. Despite the character appearing over 21 years ago, no company has made such a faithful recreation of him to this extent. Until now, that is. Limited to 500 pieces worldwide, this is truly an amazing figure. So often with figures based on wrestlers that they don’t actually look like the wrestler they’re portraying! This isn’t case with this figure from Storm. 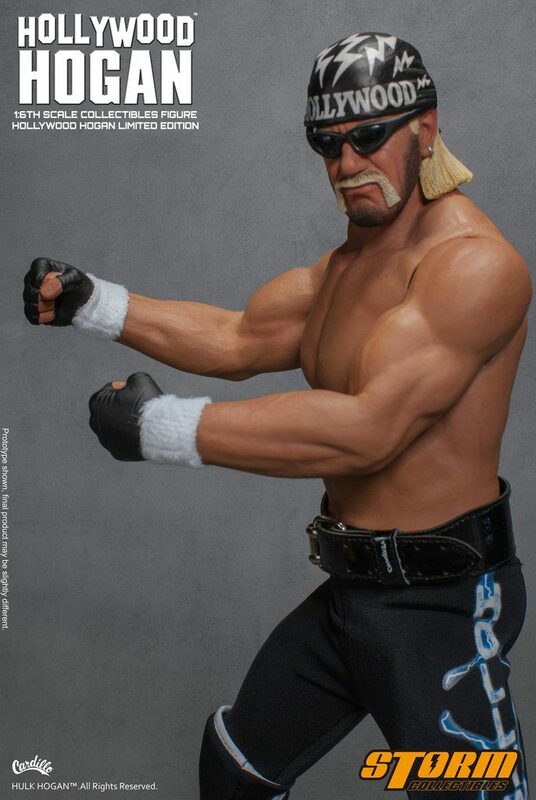 They have successfully recreated exactly how Hollywood Hulk Hogan looked in his prime. Instead of only getting one facial expression with the figure, you actually get two head mounts in the box. One is Hogan’s usual face and the other is one of him in a grimace, more in line with his heel Hollywood persona. This is actually a really nice touch and is great for those that like to mix things up a bit. It really does look just like him, even down to the signature black beard and blonde moustache. Added to this are the accessories that come with him. He comes with a removable tank top along with two bandanas. He also has a removable weight belt as well as 7 interchangeable sets of hands. As you’d expect, you also get the boots and long pants he’s famous for as well as knee pads to finish things off. Lastly, you get his famous feather boa in black and white and his sunglasses. The boa is actually in two parts, so if you only want to have him displayed with one, then you can. All of the components are built extremely well. We couldn’t find a single item that was of inferior quality, which, considering how many parts are included in this is rather exceptional. Everything felt so right and satisfying. One thing that is even more exceptional is the range of movement of the figure. Looking at it, you’d think that it would be in a singular position. However, this isn’t the case. Rather, thanks to the seamless joints, you’re able to put Hollywood into a wide range of poses he’s so famous for. The accessories are also extremely well made and you can tell that only the finest materials have been used in constructing them. This makes sense. There wouldn’t be much point in making an amazing figure and then cheap out on the accessories. Storm have bested themselves this time, which is no mean feat. They’ve done a Hulk Hogan figure before, as well as Muhammed Ali. Both of those were exceptional and Hollywood Hulk Hogan is no exception. Since these are limited to 500 pieces, they won’t last forever. You should pick up one of these whilst you still can. You are able to pick this up on Amazon in the USA. Hollywood Hulk Hogan is one of the best wrestling characters of all time. Now you can have your own collectible version of him. It’s a bit more expensive than other figures, but the quality of this makes it well worth it. It’s highly recommended.